Another classic of the 17th century in praise of the of Tiruchendur is Kandar Kalivenba by Kumaraguruparaswamigal, a disciple of Srilasri Masilamani desigar of the fourth head of the Dharmapuram Adheenam and was the founder of Thiruppananthal Adheenam which is also known as Kasi Mutt. The author was horn in 1625 A.D. of a Saiva Vellala family at Srivaikuntam on the northern hank of the Tambaraparani, nineteen miles from Tiruchendur. His parents Shanmukha Sikhamani Kavirayar and Sivakami Ammaiyar were blessed with this child after a long penance to Muruga of Tiruchendur. The boy grew of age and until his fifth year showed no signs of speech. The parents were pained at this and resorted to Tiruchendur penance again. Tired of waiting for months and seeing signs of approaching speech, the parents determined to drown themselves in the sea along with the child if he would not speak by a particular day. The day dawned, and yet there were no signs. At last, both the parents and the child entered the foamy waves. Deeper and deeper they went from knee to neck and, as they were about to sink with the waves over their heads a human form appeared with a flower in his hand and asked the child what it was; all in a surprise the child broke out in praise of the Lord with the words; “Poomevu senggamalap…” the opening lines of Kandar Kalivenba. This delightful poem of 244 lines projecting the praise of God and the truths of Saiva Siddhanta. Having studied Tamil at the feet of his father Shanmukha Sikhamani Kavirayar, and attained in it great proficiency by divine grace, he grew up to manhood, took to an austere way of life, left home, and wandered throughout the Tamil country visiting famous places of pilgrimage and composing poems on the presiding deities. From Thiruvarur Kumaraguruparar moved to Dharmapuram, reaching where his mind was signaling about a great thing that was going to happen soon. This town hosts the renowned Adheenam (mutt) of the Saiva Siddhantha tradition called Thirukkayilaya Paramparai Dharmapura Adheenam. The saint who was decorating the presidency of the mutt was Srilasri Masilamani desigar. Arriving at the mutt, Kumaraguruparar paid his obeisance to the saint. Desikar asked Kumaraguruparar to explain the significance of the song from Periya Puranam – “Ainthu perarivum kankale kolla”. This is the song that describes the state of Sundaramurthi Nayanar, as he saw the dance of Lord shiva at Thillai. Who can tell the state of that great Saint Sundarar as he saw to his ecstasy the Blissful dance of his beloved Lord ! Sekkilar has so beautifully described the union Sundarar achieved with the God at that sight. Unless by utter stupidity one tries to talk about that glory beyond any words, how can it be explained at all? Kumaraguruparar stood stunned. His words stammered. He realized that he is in front of the guru whom he has been searching for so long. He fell down at the feet of Desikar and pleaded him to initiate him in the renounced life. Desikar was not just a spiritually oriented person. He also had enough care about the society. When spiritually getting elevated, shouldn't one become full of love for all the lives around ? Desikar has realized the state in which Hinduism is getting crushed under the Moghul empire with its barbaric intolerance towards Hinduism. 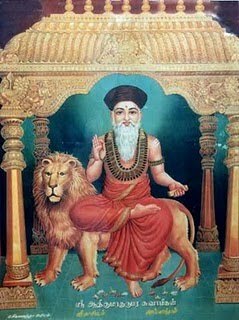 He realized the need for the spiritually high, well skilled and devoted caliber like Kumaraguruparar to strengthen the saivite wisdom in the troubled lands. So he agreed to be the guru of Kumaraguruparar on the condition that he goes on pilgrimage to Kasi and returns, subsequently he would initiate Kumaraguruparar into sanyasa. 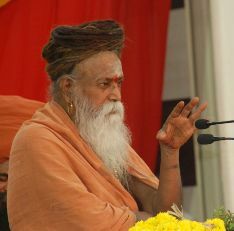 Kumaraguruparar pleaded to Desikar that it would take long time for him to complete the pilgrimage to Kasi (given the lack of facilities at that point of time). So Desikar waived off Kasi for the time being and asked him instead to stay at Thillai for period of one Mandalam (48 days). Happily Kumaraguruparar agreed to that and proceeded to Thillai Chitrambalam. On the way divinity called him to Vaithishvaran koil. There he sang Muthukkumaraswami Pillai Tamil. It is said that during the early days of Kumaraguruparar, he was invited to adorn the chair of Court poet by Thirumalai Nayakar (1623-1659 AD) and he did good service to Tamil by writing ‘Neethi Neri Vilakkam’. When he was inaugurating his devotional prabhandam ‘Meenakshi Pillai Tamil’ in praise of Goddess Meenakshi at the royal court, Goddess Herself as a young maiden appeared and seated on the lap of Thirumalai Nayakar, taking out a pearl necklace and put it on the neck of the poet and dissappeared. Kumaraguruparar enjoyed the stay at Thillai worshipping the Dancing Lord. 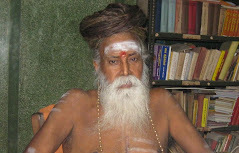 He composed on the God and Goddess Chidambara Mummanik kovai, Chidambara Cheyyut kovai, Sivakami Ammai Irattai Mani malai. On his return Desikar initiated him to the renounced life with the saffron robe. Having given the initiation, Desikar stressed him the importance of revitalizing saivism in the northern part of the country where it was suffering from the oppression by the Muslim rulers. Now Kumaraguruparar agreed to go to Varanasi. It was about the year 1658 AD. Dara Shuko was the ruler of the Varanasi province of the Moghul empire. Aurangazeb the most intolerant of the Moghul lineage was ruling at Delhi. Dara was an exceptional one in the Moghuls. He was tolerant enough to seek what the other religions have to say and encouraged discussions among the religions. He dealt with respect the scholars of Hindu religion (to be killed by his own brother aurangazeb !!). He is said to have translated some of the Upanisads into Persian language. For a long time before the successive Muslim invaders and ruined the holy city of Kasi and demolished the abode of Lord Visvanathar. At this point of time there was a critical urge to keep alive the spirituality of the suppressed Hindus. On reaching at Kasi, Kumaragurupara sung Sakala Kalavalli Malai in praise of Goddess Sarasvathi, praying her to bestow the skill of words. The blessings of Vaani came as the boon when he had to convince the opponents about the glory of the Saivism. He got to know Hindustani language by Kalaivaani's grace. Kumarguruparar wanted to meet with the Badusha, in order to establish a mutt in Kasi. Though Dara was fair with other religions, Kumarguruparar had to cross many obstacles to meet Dara. The blessed saint, who had the valiance of the spirituality, rode over a lion and went majestically into the court of Dara with all obstacle creators frightened. Dara realized the spiritual power of saint Kumaraguruparar. He showed his respect to the saint. Dara had organized an inter-religious conference. He requested the saint to address the same. Kumaraguruparar accepted the invitation and he spoke fluently in Hindustani language explaining the greatness of the philosophy of Saiva siddhanta. The audience were thrilled to know the glory of Saivism. Dara bowed down to the saint and venerated him. Dara asked him what he could do for him. What materials would the saint want, for whom only God matters. He asked the king to provide him with the land in Kasi where he can build a mutt and serve Saivism. The king gave the option of the place to the saint himself. The saint wanted to renovate the Kedareshvara swamy temple at the Kedhar ghat. He said there would be a kite that would fly above the spot, whatever be the area that it circuits in the sky, that should be given to him to build mutt. The kite (Garudan) appeared in the sky and marked the area that included the Kedhareshvarar temple and the land for building a mutt. Dara happily gave that land. Kumaraguruparar renovated the abode of Kedhareshvarar which was earlier ruined due to the religious intolerants. In the Kumaraswamy Mutt that he built, he guided the people in the glory of Saivite philosophy. His inspiring teachings paved way for the restoration of the highly adored Lord Viswanatha temple. The devotees offered lots of valuables to the saint. He took them to his guru at Dharmapuram. But Desikar denied to accept them and directed him to spend those for the spiritual development of the people of Kasi. As per that Kumaraguruparar spent the materials in spreading the message of Saivism. He visited Dharmapuram four times to pay respect to his guru. In Tamil Nadu he paved the way to build another Kasi Mutt at Thirupanandhal in Kumbakonam District. Later this mutt was enlarged by Kasivasi Thillainayaga Swamigal. 6th head in the line after Saint Kumaraguruparar swamigal, Srilasri Muthukkumaraswami Tambiram Swamigal now presides over Kasi Mutts both in Kasi and Thirupanandhal. Kumaraguruparar while in Kasi also had sung ‘Kasi Thundi Vinayagar Patigam’ and Kasi Kalambakam. It is said that Kumaraguruaparar also gave discourses on Kamba Ramayanam and among those who got inspired by that were the famous Hindi poet Tulasi Das, who wrote Ram Charita Manas. Kumaraguruparar stayed in Kasi for thirty years from 1658 to 1688 spreading the glory of Shaivism giving the vital support to the Hinduism that needed support during those troubled periods. He attained samadhi at Kasi on the third day after fullmoon day in May 1688. His vital services for the sustenance of the Hinduism will be remembered along with his beautiful compositions by the generations of devotees.